The Unknown, Entertaining Mind of Miss Dena Jones: Mardi Gras Blog Hop ! Welcome to our Mardi Gras parade! I must warn you though, while you may enjoy jumping up to catch beads, doubloons, cups, stuffed animals--whatever! Please yell at the float riders "Throw me something, Mister!" Bring a large, sturdy plastic or cloth bag to hold all the treasure you'll be catching - if you try to put all of your beads around your neck, you'll have a hard time standing up straight! Be prepared: some people get so overcome with excitement they will occasionally jump in front of you to grab what a rider has thrown to you. Don't get into a tug-o-war....there are many more floats on the way! If you're from far away, some visitors hold up a sign saying where they are from. Local riders love to see people from far away have a good time and will throw to them to make sure they do! The colors of Mardi Gras are: Purple which represents justice; Green which represents faith; and Gold which represents power. Mardi Gras is always held the Tuesday before Ash Wednesday. Mardi Gras is music, parades, picnics, floats, excitement ... and one big holiday in New Orleans! Everyone is wearing purple, green, and gold; and adorned with long beads caught from the beautiful floats. They sit on the ground throwing balls, playing music, having a picnic, and watching the crowds walk by between parades. $15 Gift Card for Treasure Box Designs (http://www.treasureboxdesigns.com/). They are asking you to stop by their blog and become a followr of their blog at http://treasureboxdesigns.blogspot.com/. They are having issues with their blog at this time but asking you become a follower! So, sit back with your beverage of choice, but keep in mind the police will be in full force watching for drunken lewdness as this is a family event! Feel free to watch in costume as this is a festive hop!! If you have arrived from Kari's blog on the parade route, then you are sitting at the best seat in the house! If you have just happened to be visiting me today, I would love for you to start at the beginning of our parade route at Lynne, your hostess, at http://slasewcraftiness.blogspot.com/ along with our marvelous co-hostess, Kimberly, at http://scrappingrookie.blogspot.com/. For my project, I created a digital recipe page. We all know that Mardi Gras festivities are one big CARAYYY-ZEEE party !!!! Now, it's no secret there there is a LOT of drinking going on during Mardi Gras! First off, I DO stress RESPONSIBLE drinking, so please, if you drink, please don't drink and drive, and please DRINK RESPONSIBLY! Hope enjoyed my float in the parade. To continue on the parade route, Your next stop is Gill's blog. I would love for you to throw me some beads (comments) in tribute to Mardi Gras! Its on my bucket list also Dena -- I am loving your digital recipe page --- and it does sound yummy up to the fact that you got hurt!!!! Thanks sew much for participating in the hop and its always a pleasure hopping with you!!!! oh so awesome!!! i would so love to go to new orleans for mari gras! YUM sounds goood... love your project.. it is sooo pretty..
Yummy - that sure must taste delish Dena! Beautiful digi recipe layout!! I will definitely be saving it for future reference :-) Happy Fat Tuesday!! Nice layout, and so colorful. Have a scrappin' good day! I love Mardi Gras,,I went 3 years in a row to new orleans,,didnt get to go this year!!! I am on my way! But warning I will have to spend the night! This 4ft 10 inch woman is not going anywhere after one of those! Very nice project! Yummy! Great recipe and great digi! Hurricanes are one of my favorites when I go to Bourbon Street (another NO favorite)! Good Luck on getting to come here for a Mardi Gras visit! ooooh nice LO and great lookin recipe!!! This is a great digital. 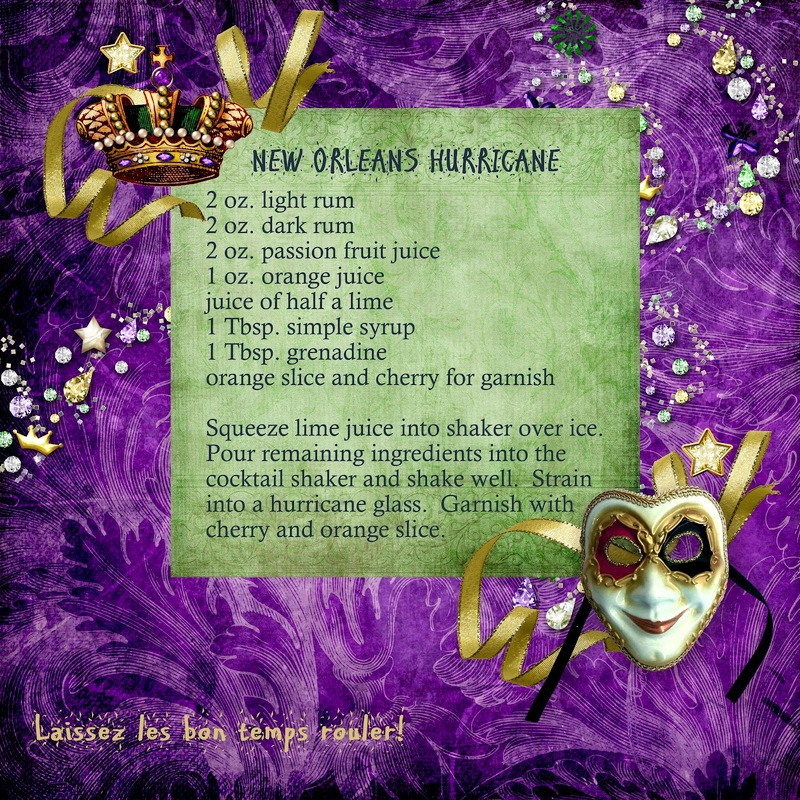 The drink recipe sounds yummy and I love the colors and the mask. Nice being in the hop with you. I love your digital recipe! Great idea. its great being in the hop with you. very colorful and very original. enjoyed it very much.